Interested in an acting career? Why not consider a degree in theatre? The Department of Visual and Performing Arts will help you shine like the star that you are. Hone your performance skills, not only with stage productions, but also with radio and TV commercials, video-game design, and sound projects. With the integration of studies in engineering technology and the arts in the entertainment technology degree, our students blend solid technical expertise with innovation, artistry, and creativity. Develop a foundation in the theory of theatre while building experience through involvement in live productions with our theatre minors. Build sets. Star in theater productions. Get a degree or minor. 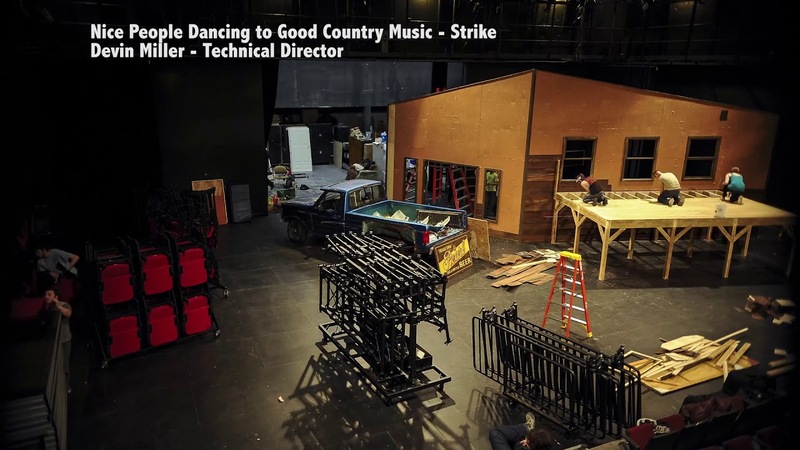 Rozsa Center for Performing Arts staff and Michigan Technological University students set up the stage for Nice People Dancing to Good Country Music, a play by Lee Blessing. Blessing's play is a fun, romantic comedy, featuring a country bar-owner, an expressive nun, her aunt, and an unlikely romance. This performance was presented by The Michigan Tech Theatre Company in spring of 2016.